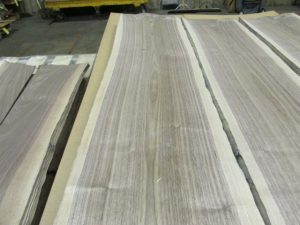 This special Walnut Veneer 1/16 is perfect for furniture, cabinetwork, interiors, floorings, turnings, novelties, gun stocks, decorative veneer, and all of your woodworking needs. Furthermore, the detail in this dark wood, sometimes called Black Walnut Veneer, is beautiful! Most of all, the timeless look of dark wood provides unmatched elegance. As a result, your woodworking will have a finished glow that can’t be beat. Source: Eastern USA and Southern Canada. Color: Sapwood whitish to yellowish-brown to rich chocolate-brown will darken when steamed; heartwood light gray-brown to rich chocolate-brown to deep purplish-brown. Pattern: Straight to interlocked or curly, wavy grained; medium to coarse textured. Characteristics: Moderately heavy, hard, strong. Uses: Furniture, cabinetwork, interiors, floorings, turnings, novelties, gunstocks, decorative veneer. Stiles and rails for stave core doors. Call us today for more information or Click Here to see more of what Marwood has in stock!